Puerto Rico’s economy has had considerable problems over the last decade, and Hurricane Maria, which struck the island just over one year ago and was the worst natural disaster on record in Puerto Rican history, greatly exacerbated them. Based on the establishment survey, there is little to celebrate. From January 2013 to August 2017 (right before the storm), the economy was losing about 1,100 jobs per month (or around 400 private sector jobs per month). In January 2017, the government enacted labor reforms that were supposed to boost the economy and stem these losses. Those policies limited bonuses and paid leave, loosened hours requirements for employers, and reduced overtime benefits among other changes. These reforms were unpopular, and they also failed to curb job loss. From the enactment of the reforms until the hurricane, employment decreased by 14,700 (5,600 private sector), and the rate of loss actually increased to 1,800 jobs per month (700 private sector). Including the time since the hurricane, employment is down by 40,500, or 23,700 private sector jobs. Hurricane Maria explains much of the decline over the last year. 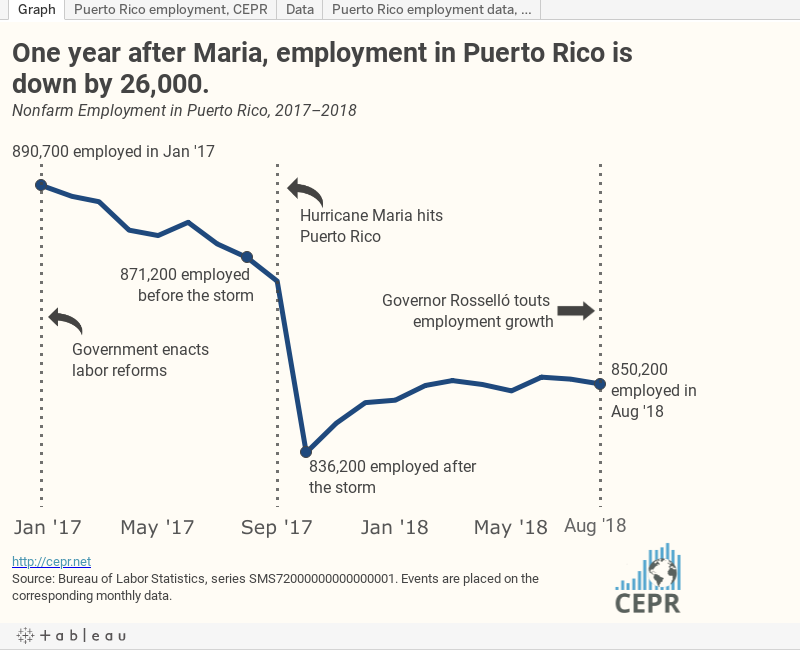 In addition to the lives lost and the catastrophic damage, the storm significantly impacted Puerto Rico’s labor market. In the month after, the island of around 3.3 million people lost almost 40,000 jobs, with total employment plummeting to 836,200 (the lowest level since the early 1990s). Since the hurricane, the economy has gained back just 14,000 jobs, or around 1,300 per month (although much of the gains were directly following the storm). Still, employment is down by about 26,000 over the last year (nearly 3.0 percent of total employment). Although Puerto Rico was losing jobs prior to the storm, the current level of employment is below what had been the trend from 2013 until the hurricane. If the economy had followed this trend, there would be over 12,000 more jobs on the island. The story changes depending on the sector. Some sectors follow the overall trend, although there are notable exceptions that were hard hit. Manufacturing fell by 1,700 jobs (2.4 percent) over the last year to 70,000 jobs, with all of the loss in nondurable goods (which has not rebounded since the hurricane). Education and health services have lost 5,800 jobs over the past year (4.7 percent), with most concentrated in health and social assistance (4,800) — a sector vital to relief efforts. The overall education and health services sector has gained just 400 jobs since its post-hurricane low of 116,000 jobs. Government employment continues to slide, down 7,700 jobs over the past year as the state government sheds workers as part of austerity packages (state government has lost 6,600 jobs, or 4.4 percent). On the bright side, leisure and hospitality has mostly recovered after losing 13,400 jobs following Maria. The sector is now down just 900 jobs for the year, with total employment at 80,300. Overall, the labor market in Puerto Rico has improved somewhat since the hurricane, but is still depressed. As the economy recovers from the hurricane, the better-case scenario seems to be returning to the pre-hurricane level of jobs, with a trend of still steady, but slower, job loss. A worse scenario is if the economy does not reach the level of jobs associated with the prior trend, either overall or for specific sectors, and the hurricane shifts the number of jobs on the island downward in the short- and medium-term.